Let us know if you want us to call you. Need to make a payment to Chalestra? You don’t need an account to use PayPal. Be sure to say who you are and why you are paying us. Also, it might be wise to send us an email when done. Note: Chalestra offers a range of advanced services that are dedicated to making small businesses more powerful. Q: Do you really offer 1 hour of briefing time for free? A: Yes. We don't expect our customers to pay while we get to understand a brief. On the other hand, once everything is understood, the brief ends. It should be read as "up to an hour", and is offered at our discretion. Q: Do you offer monthly accounts? We do offer monthly accounts to customers we know well. For new customers, we offer 7 days. In some cases, we ask for deposits or up front payments, even from monthly account holders and customers we know well, depending on the project. A: We can work anywhere in the UK, but we expect expenses to be reimbursed when we stay away, and for long-range travel. Most of the work we do is remote, though, even when we're working locally (we are conscious of keeping costs down). Internationally, we work remotely, buy always through a customer of ours. Q: What if my company is too small? There's no such thing. We work for all sizes of companies. Small companies are more capable of making big achievements than large companies since they are more dextrous. For smaller companies we are more conscious of the budget. Q: Chalestra's website doesn't really say what Chalestra does. Why? A: There's method in the madness. Chalestra does so many things that it's impossible to reflect on them all on a website in a coherent way. It's even more difficult, and against confidentiality, to say how our services are implemented. So we've made the website more social and playful instead, with hints of what we do. We talk about ourselves more in the blogs we run, on the site, on Twitter, on Facebook and on the Business Administrator website. The website is largely to encourage people to contact us. Q: How does Business Administrator fit into Chalestra's services? 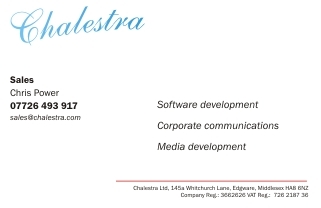 A: Chalestra is commissioned to market, sell and develop the software: the software is owned by Chris Power. Q: How do you formulate your fees? A: We charge strictly by the hour for the services we offer. Fairness is a key policy of ours. Just because you were nice enough to visit our website does not give us the right to target-market to you, and we have no desire to do that anyway - it's just not friendly. Chalestra policy is that it conducts its business in a friendly, sociable manner - we would like you to become involved with Chalestra's activities, but it's, rightfully, your call. If you wish to carry on using Chalestra’s website but do not wish cookies to be stored within your browser, please disable this option within your browser's settings. You will still be able to read all about Chalestra.